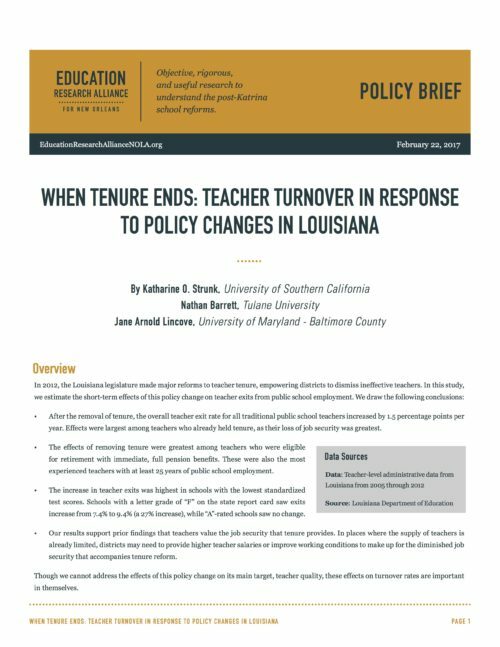 A policy brief and technical report by Katharine O. Strunk, Nathan Barrett, and Jane Arnold Lincove on the effects of tenure reform on teacher turnover in Louisiana's traditional public schools. After the removal of tenure, the overall teacher exit rate for all traditional public school teachers increased by 1.5 percentage points per year. Effects were largest among teachers who already held tenure, as their loss of job security was greatest. The effects of removing tenure were greatest among teachers who were eligible for retirement with immediate, full pension benefits. These were also the most experienced teachers with at least 25 years of public school employment. The increase in teacher exits was highest in schools with the lowest standardized test scores. Schools with a letter grade of “F” on the state report card saw exits increase from 7.4% to 9.4% (a 27% increase), while “A”-rated schools saw no change. Our results support prior findings that teachers value the job security that tenure provides. In places where the supply of teachers is already limited, districts may need to provide higher teacher salaries or improve working conditions to make up for the diminished job security that accompanies tenure reform. Though we cannot address the effects of this policy change on its main target, teacher quality, these effects on turnover rates are important in themselves.